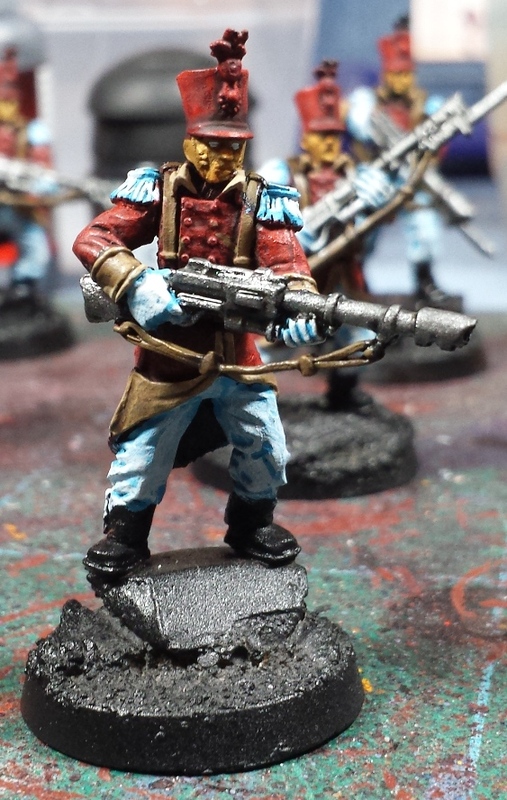 Mordian 7th Regiment: Heresy Era Thousand Sons - Spireguard batch painting complete! Heresy Era Thousand Sons - Spireguard batch painting complete! Managed to finish off the Spireguard on Saturday, but didn't get a chance to snap any pics until this afternoon. Time to work on the metallics! Started off by blocking in all of the boltgun metal on the weapons thereby covering up all the slop from the gloves. 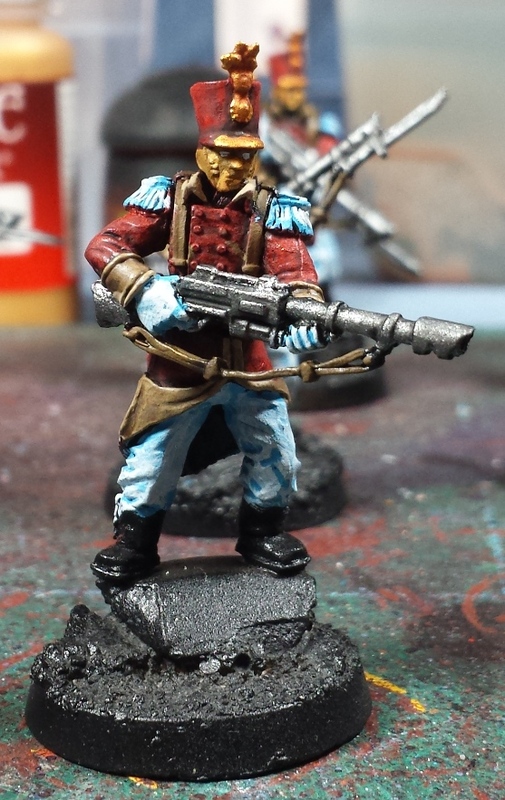 Next up are a dark tone wash to give them a bit of depth (though the pics washed out the shading a bit). 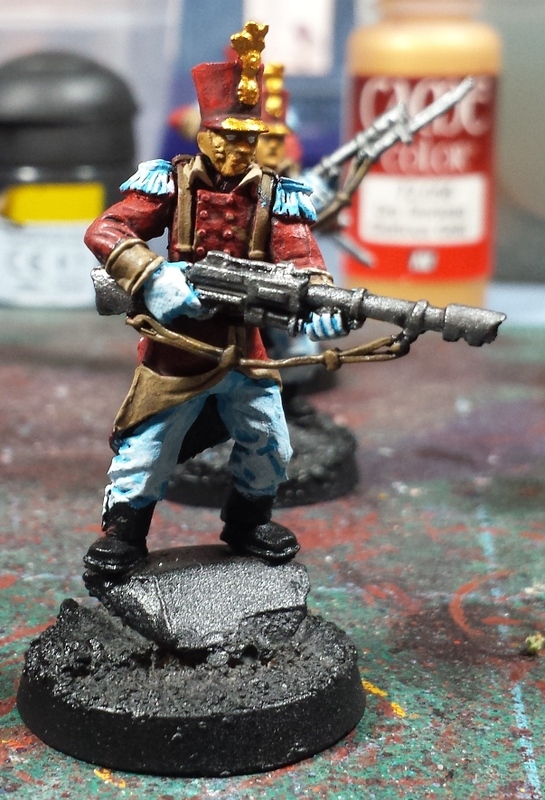 Finally, a little gold on the shakos to give them a little detail and draw the eye to the head of the model. The gold was hit with a little Reikland Fleshshade to provide shading. The above four steps took another half an hour for application since they were all little tiny areas. 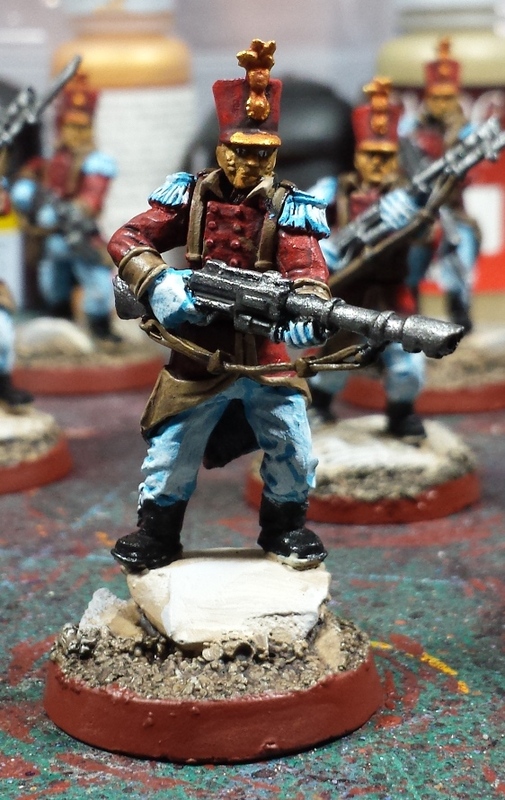 Infantry models done! The bases were all given a basecoat of Khaki, which is where I left off for the day on Saturday. Another hour's worth of work, and some very messy fingers! On Sunday following the fun times at Feast of Blades (pics to come soon), I knocked out the last of the base painting, with a quick drybrush of Bonewhite and Ghost Grey on the stonework, and a Strong Tone wash on the ground. Once that dried, the rims were given a hit of Dark Flesh. 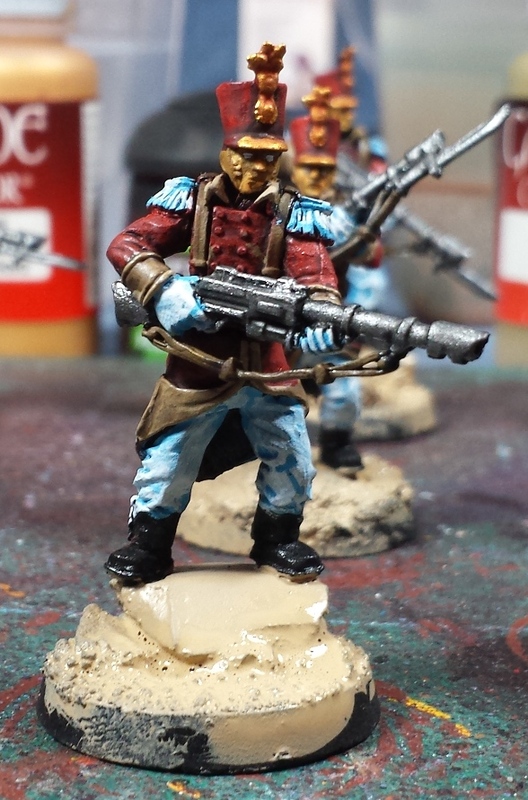 After a shot of matte sealant, I pulled out all the previously-painted riflemen and got a final pic. Total time from beginning to end was just shy of 9 hours spread out in chunks over the better part of 10 days - I'll be the first to admit that it wasn't necessarily the most exciting of 9 hours (indeed, batch painting can definitely get tedious), but it really feels good at the end when there's a whole pile of finished miniatures ready to take to the field! Looking really good, and a fine walk through. Very impressive. I don't know how you can do it, if I say down with all those sitting on the desk in front of me i'd just stand up and walk away again. You sir are a machine! I struggle to batch paint 5 minis let alone that amount so kudos to you! Looking so good! Are you sure you don't have servo arms? Listen, and understand. That Mordian is out there. It can't be bargained with. It can't be reasoned with. It doesn't feel pity, or remorse, or fear. And it absolutely will not stop, ever, until you are painted. Cripes mate. Very well done. These fellows look great. What's next? @Rictus: I appreciate it! Yeah, the initial couple passes through the batch are disheartening, but once the base colors go on it really gains momentum and it gets easier. @Greg Hess: Hah! I would totally have a servo harness installed, given the opportunity! @Jugger: Hahaha! "Come with me if you want to paint..."
@Dai: Thanks very much! Going to work on a set of Space Hulk minis for a buddy of mine next, quite a change of pace. A really fantastic-looking force - very characterful. I really like how they have a distinct '30K' feel about them. @Pawn Cocktail: Thanks very much, man! 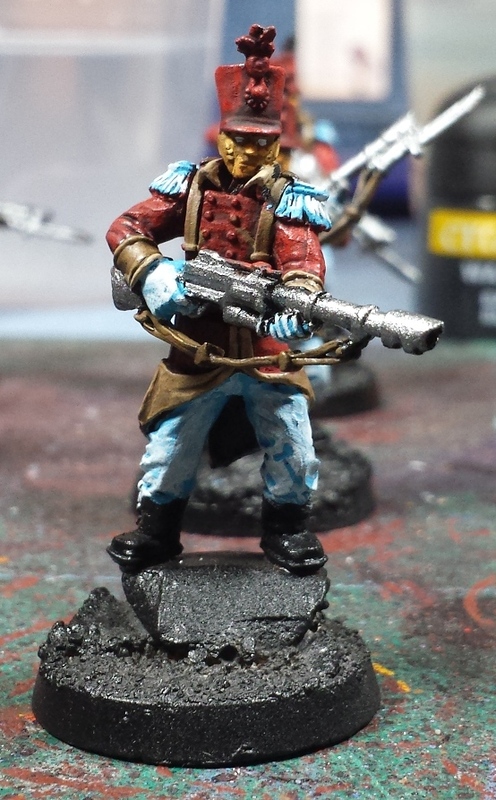 Love the Napoleonic look and the use of the zzap gun is always a good choice. I had done so on my Genswick before selling them.